Research and development efforts on lower frequency, higher penetration ultrasonic transducers, coupling methods, and instrumentation are meeting the requirements for nondestructive evaluation of advanced ultra-low weight and high strength composite materials. Herein, three newly developed methods are described along with their associated instrumentation. These methods are squirter-based 250 kHz transducers, dry-coupled 250 kHz roller probe composite transducers, and air-coupled transducers of 100 kHz and 250 kHz. A 250 kHz squirter-based transducer pair is designed to favor increased loop sensitivity, or voltage gain, in through transmission mode. The transducers afforded a minimum 6 dB increase in amplitude when testing difficult to penetrate foam and honeycomb core composite materials, essentially doubling the signal to baseline noise level and enabling inspection of several components heretofore not adequately penetrated with ultrasound. Recently developed 250 kHz composite transducer roller probes provided a greater than 8 dB increase in through transmission amplitude compared to conventional PZT (lead zirconate titanate). Mixed coupling mode inspection employing a dry-coupled roller probe transmitter with a non-contact air-coupled receiver is also addressed. The large signal loss from one air-to-component interface is eliminated, transmit side destructive interference is reduced, and susceptibility of the high gain receiver channel to roller vibration is alleviated. Results are presented from several applications employing enhanced air-coupled ultrasonic transducers. Novel horn collimators with integral acoustic shielding are discussed that enable improved imaging of internal structural detail and near-edge defects. These collimators with integral acoustic shielding also minimized wrap-around of the signal, thereby enabling an increased pulse repetition rate that supported scan speeds up to 0.8 m/s at a 3 mm pixel increment. The versatility of choosing 100 kHz or 250 kHz transducer frequencies and utility of selecting the wave mode for through transmission imaging to overcome standing wave or resonance problems commonly encountered in air-coupled ultrasound inspection are addressed. As the weight or bulk density of composite components has decreased and the size of structures has increased, requirements for ultrasonic NDE (nondestructive evaluation) of more critical structural aerospace components have become more demanding. For example, complex-shaped composites with thick honeycomb or low-density foam cores with integral bondlines present a particular challenge due to their high-attenuation of ultrasound. Large robotic gantry ultrasonic systems are now in common use for production inspection of aerospace components in the frequency range of 500 kHz to 5 MHz, and this equipment typically employs squirter-based, water-coupled transducers. Herein, three complementary newly developed methods are described along with their associated instrumentation. These methods are squirter-based 250 kHz transducers, dry-coupled 250 kHz roller probe composite transducers, and air-coupled transducers of 100 kHz and 250 kHz. Roller probes and air-coupled transducers are investigated because in-process inspection of composite subassemblies sometimes requires dry or non-contact methods. A systems approach to establishing excitation alternatives, transducer and coupling designs, and preamplifier selection is investigated because increased sensitivity in proximity to the transducers is particularly significant for difficult to penetrate composites where the baseline noise level becomes too great relative to the low level of the transmitted signal. Authors of this manuscript recently published a detailed description of the approach and parametric testing utilized for development of the 250 kHz squirter-based and 100 kHz air-coupled transducers fabricated using standard piezoelectric ceramics (1).A 250 kHz composite transducer pair has since been developed for roller probe and higher-frequency air-coupled techniques. Use of ultrasonic transducers with different material, electrical, or geometric properties for the transmitter and receiver is not new in research (2-6). Standard piezoelectric ceramic materials were employed in fabricating 250 kHz transducers with the characteristics shown in Table 1. Relative impedance of the receiver and transmitter conducive to voltage gain was obtained with proprietary internal design. Ultimately, a -400 Vp square wave pulser was employed for the applications discussed. Toneburst excitation is presented as an option, and it was used to study the influence of transducer, source, and terminating impedance alternatives on voltage gain. The square wave pulser is light and suitable for scanner bridge mounting. The toneburst system has a chassis mounted signal generator and rf amplifier, and a remote rf transformer that can be located in proximity to the transmit transducer. The rf transformer output impedance is tap selectable, enabling better matching to the transmit transducer and reduction in reverse power. The low-noise 20 dB preamplifier employed can be located as close as 203 mm (8 in) to the transducer, because it is supplied power via power coupling on the coax cable and is in a sealed miniaturized package. The experimental configuration is illustrated in Figure 1 for the toneburst system excitation. Preliminary measurements were made with a 50.8 mm (2.0 in) water path, approximately the combined nearfield or natural focal distance of the transducers. Fig 1: Experimental Configuration. Shown for toneburst with the final connections. Reciprocity was first monitored employing an X3037 transmitter and a similarly fabricated X3037 as a receiver. The rf transformer was bypassed so that the 50W rf amplifier source impedance and 50W receiver termination matched. Voltage was monitored at the receiver transducer termination and at the terminals of the transmit transducer. With a 30 Vpp input toneburst, reciprocity was observed with approximately a 170 mVpp output for either direction of through transmission, as expected. One X3037 was replaced with the intended X3038 receiver and reciprocity was again observed, with approximately 80 mVpp for either direction of through transmission. Reduced amplitude compared to the X3037 was expected because the element diameter, or area, was reduced, as was the geometric selectivity of the nearfield. Reciprocity typically is maintained for transducers of different characteristics as long as the source and transducer terminating impedance are matched, as was here evident. Of course, the goal is to promote asymmetry conducive to enhanced voltage gain. Introducing the high-impedance preamplifier as the terminating resistance for the X3038 receiver resulted in a measured output voltage of 1 Vpp, or a 22 dB increase in amplitude. Further measurements were conducted employing the 50 W receiver termination and the 100 kW preamplifier receiver termination, and representative data are provided in Table 2. The X3037 transducer was used as the transmitter throughout the remainder of testing with a toneburst excitation. Large improvement in voltage output in proximity to the transducers is apparent from the data, and enhancements greater than 20 dB could be obtained by simply recognizing the benefit of selecting the high-impedance termination. A more practical perspective is provided by comparing the voltage output of the X3037 receiver to the X3038 receiver with the italicized conditions: the improvement is 6 dB (20 log (49/24.50)). This level of improvement is significant because it doubles the signal amplitude at the transducer before noise is impressed upon it in cable paths or via thermal noise of amplifiers. -400 Vpp excitation and 500 W impedance yielded 130 m Vpp. It is clear that the lower frequency portion of the spectrum is contributing to the signal amplitude. A 1 MHz through transmission scan of the composite panel is shown in Figure 2A, which was obtained employing the 5077PR square wave pulser and the receive instrumentation previously described. An 80 dB logarithmic amplifier was used to enable a wide dynamic range of amplitude to be displayed in a single image. Broadband V303 1 MHz/12.7 mm (0.5 in) diameter flat transducers were utilized. The panel had blocks with graphite-epoxy and fiberglass skins with different densities of foam core, and thickness stepped from thin to thick, from top to bottom, as shown. 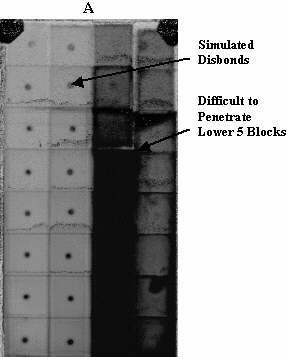 The most difficult to penetrate blocks had graphite-epoxy skins with a very low-density foam core, and this is the dark section shown in Figure 2A. Fig 2: Improved Scans. A 1 MHz scan is shown (A). The 5 lower bocks of column 3 had the most difficult to penetrate core. 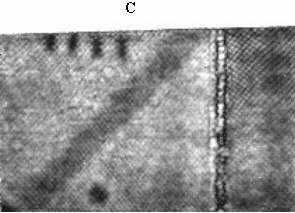 These blocks are shown scanned with the mismatched pair (B) versus the newly developed transducer pair (C). Numerous conventional transducer combinations were employed prior to the present study with the best results obtained utilizing an obsolete 250 kHz/28.6 mm (1.125 in) diameter flat and 333 KHz/12.7 mm (0.5 in) diameter flat mismatched pair. The low-signal amplitude transmitted resulted in relatively high-baseline noise levels; nonetheless, the difficult to penetrate section could be imaged as shown in Figure 2B. The logarithmic amplifier was not employed for localized scans. For the improved transducers (250 kHz) and technique, the through-transmission amplitude was a minimum of 6 dB greater than for the conventional transducers tested. The baseline noise level observed after amplification of the signal and impressed noise was about 1% of the full signal height, and the resultant ultrasonic data are displayed in Figure 2C. Images with toneburst were similar. Roller probes (often referred to as wheel transducers) are sometimes employed for ultrasonic NDE of composites. Typical applications include inspection of graphite-epoxy clad honeycomb core components with flat or simple contours and in-process materials such as non-clad cores and cores with porous skins that cannot be wetted with water. Essential characteristics of the newly developed composite transducers used in the roller probes are provided in Table 3. Relative impedance of the transducers conducive to voltage gain was obtained with proprietary internal design. The -400 Vp square wave pulser and receiver instrumentation described in the above section was again utilized. One of two roller probes employed in through transmission is shown in the image in Figure 3. The transducer is stationary in the roller with ultrasound coupled via oil to the acrylic roller face. A polymer compliant layer aids in coupling the acrylic roller to the component under test. 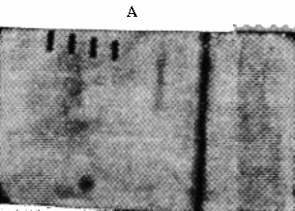 A typical image of a clad honeycomb core composite panel is shown revealing intentionally damaged core. The pneumatic actuator provides a repeatable contact force. Fig 3: One of two roller probes employed is shown along with an image of a clad honeycomb core composite specimen with intentionally damaged core. The newly developed 250 kHz composite transducer roller probes were compared with an obsolete 250 kHz pair of PZT based transducers mounted in the same rollers. The PZT transmit and receive transducers had matched impedance and were packaged to have the same effective element diameter as the composite transducers. Although the construction and electrical characteristics of the pairs of transducers were markedly different, a comparison of through transmission amplitude was informative. 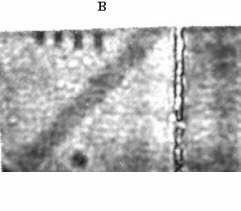 With the pairs of transducers "kissed" (direct contact of the rollers), the 250 kHz composite based roller probes provided an 8 dB increase in through transmission amplitude compared to conventional PZT based probes. In an additional test, scanning through a 203 mm (8 in) thick non-clad honeycomb core with an integral bond layer, the 250 kHz composite based roller probes provided an average of 10 dB increase in through transmission amplitude compared to the PZT based probes. The primary difficulty with air-coupled transducer techniques is the high signal loss at solid-to-air and air-to-solid interfaces due to the gross acoustic impedance mismatch. Earlier efforts (1965 and earlier internal work by Lynnworth, Carnevale, et al.) focused on reducing the impedance mismatch between piezoelectric ceramics and air or gases (7). A theoretical basis for matching layer design has evolved (7-10). Recent reports indicate that the impedance matching problem has been overcome to the extent that employing air-coupled ultrasound is in common practice (11-19). The present effort expands on technology developed for transducers of 50, 100, 200, and 500 kHz for air-coupled applications (20). The need for various frequency air-coupled techniques is associated with the tradeoff between penetration and resolution, as is the case with water-coupled ultrasound. For air-coupled ultrasound, the problem with standing waves and resonance with thickness of material under test is more pronounced because of the high reflection at solid-to-air interfaces. The wavelength in the material is also longer at the lower frequencies used, and this has to be considered with regard to l /2 and other trapping resonances within the component under test. The option of selecting 100 kHz or 250 kHz and wave modes of longitudinal or shear has provided needed flexibility to address applications encountered to date. Representative calculated wavelengths at the center frequency for graphite-epoxy composite material with a longitudinal wave acoustic velocity of 2.9 mm/ms and shear wave velocity of about 50% of this value are provided in Table 4. Wavelengths in air are provided for later reference using a velocity of 0.343 mm/ms at 20 ° C.
The wave modes of air-coupled ultrasound are discussed in the literature (21); however, a theoretical basis for selection of angles and offsets for the transducers appears to still be emerging. Experience with the applications discussed below indicates that the transducers can be operated normal to the surface of thin-skin composites or non-clad honeycomb cores. Inspection of thick-skin composites or metals with honeycomb cores, where more pressure is required, favors use of off-normal angles to overcome standing wave problems. For composite or metallic aluminum components with perpendicular honeycomb structures, experience has shown operation with the transducers set just beyond the first critical angle appears sufficient. It can be visualized that with the transducer set at an angle to the front surface, high-amplitude reflected waves at the air-to-solid first interface are less likely to set up standing waves between the transducer and component. The longitudinal wave mode converts to propagate the shear wave in the skin. At the exit from the component, the shear wave must mode covert to a longitudinal wave to be received by the transducer. In through transmission, both transducers are set to the same angle and offset in the scan direction to maximize the signal. The 100 kHz PZT transducers and optional horn collimators were described in detail in a recent publication by authors of this manuscript (1). The 250 kHz composite based transducers used for air-coupled ultrasound are the same devices described for the roller probes with the addition of l /4 impedance matching layers designed for air. Particular advantages of these low frequency transducers are their element diameters, which provide concomitant short nearfield distances and small beam diameters. The 100 kHz PZT transducer provides a nearfield of approximately 18 mm (0.7 in) and a calculated -6 dB beam diameter of about 4 mm (0.16 in). The 250 kHz composite transducer provides a nearfield of approximately 29 mm (1.14 in) and a calculated -6 dB beam diameter of about 3.2 mm (0.13 in). Toneburst is the technique of choice for most applications of air-coupled transducers. A comparison of the through-transmission amplitude as measured through a moderately attenuating composite specimen is provided in Table 5. The preamplifier, receiver chain, square wave pulser, and toneburst system are the same as described earlier for water coupling. A high-voltage spike pulser provides a performance baseline. The toneburst excitation provided 45.9 dB more signal overall. Squirter-based through-transmission techniques limit the sound to the water stream. The transmitted pressure is limited in extent by the water nozzle, providing a concentrated wave front. The received signal is limited by the water stream and nozzle, and, in conjunction with the focal length, beam diameter, and diameter of the receiver, this establishes a complex system that is geometrically selective to signals in the primary direction of propagation. Experience has shown that reducing the squirter nozzle diameter increases the structural detail viewed in images and improves near-edge flaw detection, albeit with some amplitude loss. Air is an infinite media, and the signal propagates around edges. This signal is very large and delayed in time due to the low speed of sound in air. Wrap-around occurs when the delayed signal enters the gate of the subsequent pulse. Pulse repetition rates needed to avoid wrap-around are too severely limiting for practical production scanning. In X-ray imaging, collimators are used to limit the scattered signal contribution to image forming primary radiation (22, 23). With ultrasound, experience has shown that smaller receive transducer diameters used sometimes in conjunction with apertures (an opening or hole) increase the structural detail viewed in through-transmission imaging of scattering material such as particulate graphite. Apertures were employed in various sizes and configurations on both transmit and receive sides. Different materials were employed, but for the air-to-solid interface, most materials appear acoustically hard, or high in impedance mismatch. Reflections from the material surrounding the opening cause standing waves and destructive interference that severely limit the signal. Imaging of structural detail in components was improved, however. An inverse conical horn was tested on the transmitter with great reduction in the problems associated with reflections. Various combinations of horns and apertures were attempted, and parametric testing along with a more theoretical basis that emerged resulted in the use of an inverse horn collimator with a more exponential flare on the transmitter and receiver, as shown in Figure 4. As will be shown, the combinations tested revealed improvement in the structural detail viewed, and ultimately little amplitude of the through-transmission signal was sacrificed. Fig 4: Horn Collimators. Inverse horn collimators are shown with an exponentially shaped flare and additional acoustic shields. Horns for musical instruments are typically designed so that the resonance or standing waves that result sharpen pitch. Resonance is wanted in this case, and is a complex function of geometry and wavelength. It may be intuitive that as the wavelength becomes small relative to the horn dimensions, or even to a simple tube diameter, the interaction or impedance becomes less significant. If the wavelength is large, the horn opening (mouth) must be larger to enable more sound to escape. If the horn mouth is large, the horn must be long so that the flare is gradual and intermediate reflections are avoided (24). Horns for loud speakers are designed to avoid deleterious resonance, and the smaller horn opening (throat) is sometimes used to reduce the impedance mismatch to air. Equations modeling the impedance at the horn throat or simply for tubes typically show complex impedance where the reactive term diminishes with wavelengths much smaller than the diameter of the horn (24). The wavelengths of ultrasound in air at 100 kHz and 250 kHz favorably scale the horn to dimensions suitable for the transducers of interest, and the throat can be kept relatively large. Dimensions of the horn geometry, materials employed, matching layers, and internal design of the transducers are proprietary, and beyond the scope of this paper. Loss in through transmission amplitude was observed with the longer wavelength 100 kHz transducers for a 152.4 mm (6 in) air path employing different types of collimators. The conical and more exponentially flared horn collimators had reduced losses compared to a simple aperture. Fig 5: Through-Transmission Scans. Squirter-based scan (A), air-coupled 100 kHz scan without collimators (B), and with horn collimators (C) are shown. An aluminum skin to aluminum honeycomb core structure is imaged with air-coupled ultrasound (D). Through-transmission images are provided in Figure 5 of a graphite-epoxy composite specimen with perpendicular honeycomb core. Near-edge tabs of 6.4 mm (0.25 in) width are spaced 3.2 mm (0.13 in), 6.4 mm (0.25 in), 9.5 mm (0.38 in), and 12.7 mm (0.5 in) from the top edge of the specimen. Figure 5A shows a 1 MHz squirter-based scan for comparison. Air-coupled 100 kHz scans are shown without collimators in Figure 5B and with the horn collimators in Figure 5C. The horn collimators enabled improved imaging of internal structural detail and near-edge defects. The prevailing loss in edge detection relative to squirter-based imaging can be mitigated by masking edges with foam, but this would not be practical for some contour following cases. 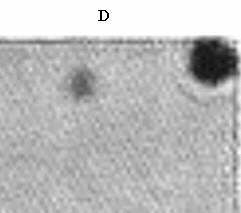 A known internal disbond was detectable in all images. A near-surface band that significantly increased the acoustic impedance mismatch was detectable in air-coupled scanning, but not with water coupling. The scan shown in Figure 5D is a 100 kHz toneburst technique with the transducers set just beyond the first critical angle of the aluminum skin to aluminum honeycomb material, as discussed. Disbonds at the skin to core interface of 9.5 mm (0.38 in) and 22 mm (0.88 in) are detected. In another 100 kHz toneburst application, non-clad honeycomb cores of up to 305 mm (12 in) thick with integral epoxy bond lines were inspected with normal incident angles. Time-of-flight measurements confirmed that the sound traveled within the interstices of the honeycomb. All intentional disbonds were detected. The horn collimators with integral acoustic shielding minimized wrap-around of the signal in this application, thereby enabling an increased pulse repetition rate (250 Hz) that supported scan speeds of up to 0.8 m/s at the pixel increment of interest (3 mm). Mixed coupling mode inspection employing the dry coupled 250 kHz composite transducer roller-probe transmitter with the non-contact 250 kHz air-coupled receiver was performed. A graphite-epoxy composite section with overall thickness similar to the sample imaged in Figure 5A-5C (about 25 mm thickness) but with thick skins could not be readily inspected for simulated disbonds within the skin plies with air-coupled ultrasound. The 100 kHz approach penetrated the sample, but with inadequate detectability. A 100 kHz air-coupled through transmission scan of the component is shown in Figure 6A. Intentional impact sites and associated disbonds between the skin and core were readily detected in the thin-skinned central section of the component, as shown. The thick-skinned regions were imaged as the darker areas in the scan at 100 kHz and an intentional simulated disbond was not detectable. The higher frequency 250 kHz air-coupled approach did not provide adequate penetration. Squirter-based 1 MHz through transmission scans readily detected the simulated disbonds not detected with the air-coupled techniques, and other inter-ply defects that were not detectable with any of the 250 kHz or lower frequency approaches. Fig 6: Mixed Coupling.The 100 kHz air-coupled approach penetrated the sample, but with inadequate detectability (A). The simulated disbond was detected employing the dry-coupled 250 kHz composite transducer roller-probe transmitter with the non-contact 250 kHz air-coupled receiver (B). The scan in Figure 6B shows the same component imaged employing the dry coupled 250 kHz composite transducer roller-probe transmitter with the non-contact 250 kHz air-coupled receiver. The simulated disbond is revealed in the thick-skinned region. Note that the section scanned was reduced in extent and the orientation was flipped with the roller probe configuration. The large signal loss from one air-to-component interface was eliminated, transmit side destructive interference was reduced, and susceptibility of the high gain receiver channel to roller vibration was alleviated. The improvement in signal to background baseline noise level and shorter wavelength ultrasound improved detectability. The air-coupled receiver enables an ultra-low weight receive-side manipulator without the need for a squirter water supply, heavy pneumatics, or rollers for inspection. The low weight air-coupled transducer can be configured with an extended reach internal manipulator which, when combined with an external transmitter roller probe, is suitable for inspection of difficult to access components such as cylindrical composite structures or tubes. The voltage output of the newly developed 250 kHz squirter-based transducer pair was maximized for the existing instrumentation via parametric testing of electrical termination alternatives. An improvement of 6 dB was quantified for the intended transducer configuration. This level of improvement is significant because it doubles the signal amplitude in proximity to the transducers before noise is impressed upon it in cable paths or via thermal noise of amplifiers. Resultant through-transmission images extended the useful range of the technique for inspection of difficult to penetrate composites. The air-coupled transducers and toneburst system enabled low-frequency inspection of composites. Optional horn collimators and acoustic shields increased the structural detail observed in images and afforded increased pulse repetition rates by reducing wrap-around problems. The applications database continues to define areas of use for the low-frequency techniques including the potential for mixed mode coupling. The authors would like to acknowledge continued consultation on transducers with Toan Nguyen and Yi Liu; Doug Coulter, Pat Iverson, and Dan Kaine for fabrication, modeling and characterization; Boris Dvoskin for interaction on the square wave pulser; the automated systems crew for support on equipment issues; Ken Fowler and Gerry Elfbaum for their support and direction throughout the projects. D. J. Cotter, T. E. Michaels, J. E. Michaels, D. Kass, M. E. Stanton, I. V. Kosenko, and F. H. C. Hotchkiss, " Low-Frequency Ultrasonic Imaging of Composite Structures with Squirter-Based Water-Coupled and Air-Coupled Transducers", Proceedings of the 45th International SAMPE Symposium, SAMPE, May, 2000. M. G. Silk, Ultrasonic Transducers for Nondestructive Testing, Adam Hilger Ltd Publishers, 1984, pp. 9-12 and 149-150. J. Callerame, R. H. Tancrell, and D. T. Wilson, 1979 IEEE Cat. 79CH 1482-9SU(London: IEEE), pp. 407-411. C. J. Drost and G. J. Milanowski, "Self-Reciprocity Calibration of Arbitrarily Terminated Ultrasonic Transducers", IEEE Trans. Sonics Ultrason., Vol. SU-27, No. 2, pp. 65-71, 1980. "IRE standards on transducers: Definitions of terms," Proc. IRE, vol. 39, pp. 897-899, 1951. H. E. Van Valkenburg, "Optimization of Ultrasonic Through-Transmission NDT Systems," Proceedings of the 11th World Conference on NDT, pp. 792-798, 1985. L. C. Lynnworth,"Ultrasonic impedance matching from solids to gases," IEEE Trans. Sonics Ultrason., Vol. SU-12, No. 2, pp. 37-48, Mar. 1965. W. J. Fry and F. Dunn, J. Acoust. Soc. Am., Vol. 34, 1962, p 188. C. S. Desilets, J. D. Fraser, and G. S. Kino, IEEE Trans. Sonics Ultrason., Vol. SU-25, No. 3, pp. 115-125, May 1978. M. Brekhovskikh, Waves in Layered Media, 2nd ed. New York: Academic, 1980, pp. 23-26. L. C. Lynnw orth, D. R. Patch, and W. C. Mellish, "Impedance Matched Metallurgically Sealed Transducers," IEEE Trans. Sonics Ultrason., Vol. SU-31, No. 2, pp.101-104, 1984. M. Deka, "Air-Coupled Ultrasonic Transducer for NDE", Proceedings 1987 IEEE Ultrasonics Symposium, Vol. 1, pp. 543-546, IEEE Cat. No. 87Ch2492-7, 1987. B. T. Khuri-Yakub, J.H. Kim, C-H. Chou, P. Parent, and G. S. Kino, " A New Design for Air Transducers, Proceedings 1988 IEEE Ultrasonics Symposium, Vol. 1, pp. 503-506, IEEE Cat. No. 88CH2578-3, 1988. J. D. Fox, B. T. Khuri-Yakub, and G. S. Kino, "High-Frequency Acoustic Wave Measurements in Air," Proceedings 1983 Ultrasonics Symposium, Vol. 1, pp. 581-584, IEEE Cat. No. 83CH1947-1, 1983. J. D. Fox, B. T. Khuri-Yakub, and G. S. Kino, "Excitation and Detection of 8 MHz Acoustic Waves in Air, Proceedings 1984 Ultrasonics Symposium, Vol.1, pp. 475-479, IEEE Cat. No. 84Ch2112-1, 1984. US patent 5,287,331 Feb 15,1994, D.W. Schindel and D. A. Hutchins. J. O. Strycek and H. Loertscher, "Ultrasonic Air-Coupled Inspection of Advanced Material", NDT.net Vol. 4, No. 12, December 1999. J. Buckley and H. Loertscher, "Frequency Considerations in Air-Coupled Ultrasonic Inspection," Insight (Journal of The British Institute of Non-Destructive Testing), Vol. 41, No. 11, pp.696-699, 1999. Curlin Air Technical Note 2, "Acoustic Impedance and Airborne Ultrasound," Curlin Air Publisher, Huntington Beach, CA, December 1, 1998. L. C. Lynnworth, T. H. Nguyen, C. D. Smart, and O A. Khrakovsky, "Acoustically Isolated Paired Air Transducers for 50-, 100-, 200-, or 500-kHz Applications," IEEE Transactions on Ultrasonics, Ferroelectrics, and Frequency Control, Vol. 44, No. 5, pp.1087-1100, 1997. J. O. Strycek, W. A. Grandia, and H. Loertscher, "Wave Modes Produced By Air Coupled Ultrasound," Present Application Workshop, NDT.net, Vol. 2, No. 5, May 1997. U. S. Patent No. 5,033,074, July 16, 1991, D.J. Cotter and W.D. Koenigsberg, "X-ray Collimator for Eliminating the Secondary Radiation and Shadow Anomaly from Microfocus Projection Radiographs". W. D. Koengisberg and D. J. Cotter, "On the Origin of Anomalous Shadows in Microfocus Projection Radiography," Proceedings 1990 Conference on NDE of Modern Ceramics, pp. 56-62, American Society for Nondestructive Testing, Columbus, OH 1990. P. M. Morse, Vibration and Sound, 2nd ed. Published by American Institute of Physics for the Acoustical Society of America, 1976, pp. 265-288.